The human brain processes twelve tasks per minute. Omatum can process, maintain, and update 60 tasks per open instance at the speed of your CPU. Life is a complicated symphony of events, it isn't easy to arrange a perfect solution on your own. 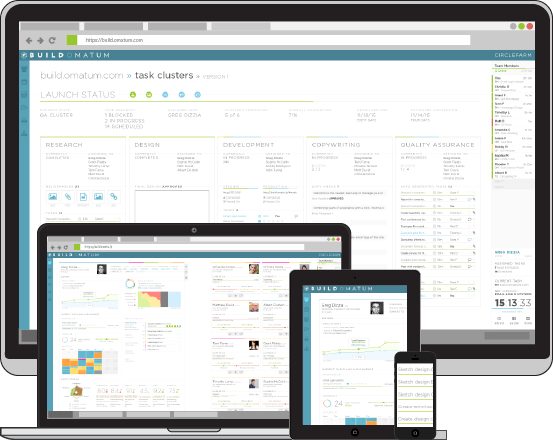 Omatum creates tools to put you in control of your personal and professional life. We use data–driven automation, idea suggestion, and guided plans to help you achieve your goals. Our products interact with you to help you unlock your full potential. Prioritize tasks efficiently. Users estimate, plan, and track time. Our system will reorder tasks in a project and automatically schedule the work so deadlines are achieved and timelines remain accurate. Stay connected and in control. Get a comprehensively deep overview of all of your projects. Easily wrangle complicated projects into a simple interface and always know where the team stands relative to milestones, deadlines, and budget. Utilize data–driven intelligence. Track and evaluate employee productivity, skill level, effectiveness, and overall health to make informed decisions and inspire greater performance. Integrate, automate, and stay in the zone. We provide seamless workflow integration from the software you're already using to the OMATUM cloud, so your tools can directly work with our systems. Stay anywhere and connect to BUILD. Pull ideas out of the ethos and provide documentation for the purpose and plans of what you’re working on. From sketch to wireframe to mockup, refine designs with feedback and approvals. Track code from local development to production deployment with our six–step progress metric. Collaboratively create meaningful content that incorporates the overall needs of the project. Fight against bugs and errors making it into the final product with smart generated QA checklists. Providing a detailed overview of node health and estimated completion times for all tasks. Control project costs and view actual spending against budget. Reports can display financial estimates and a real–time indication of spend. Explore without fear. Projects are maintained within version groups. Create iterative versions, track changes, and plan features for the future. Easily view and manage with our simple dashboard. Explore the data, find new ideas, and empower employees with actionable insight. Nothing gets in the way of projects moving forward. Real–time infrastructure means data stays fresh and relevant. Beautifully display on a desktop, laptop, or presented on a big screen. Coming soon to tablets and smartphones. Stay on top of the latest action. Personalized messages sent via text, email, or in–app inform you of new activity that matters. Collaborate with ease. Simultaneously view shared content within the system to provide context and accelerate communication. Join effortlessly. Any authorized user can set up employee accounts and manage access with roles or custom user permissions. Build faster. Build better. Build more. Manage all your projects in one place and take advantage of unlimited document storage. Start with the end in mind. Structure and categorize information visually to obtain the big picture then drill down into the details. Enhance decision–marking. Present important statistics with visually appealing reports to give others a detailed understanding of the data. Beyond monitoring, the system will predict missed deadlines based on current pace of progress, helping manageres proactively resolve issues. Launch with BUILD, scale with &GROW. Releasing a product is the tip of the iceberg. &GROW attaches to existing BUILD projects and will manage post–launch processes. Measure your success. Monitor and share all your business data in one place. Spot emerging trends, threats, and opportunities in real–time. Grow the business. Build, automate, and launch successful campaigns. Our best practice templates will give you the power to scale your marketing operations. Acquire and keep customers happy. We help you understand your users based on who they are and what they do. We help your product become something they love and need. Little hinges swing big doors. 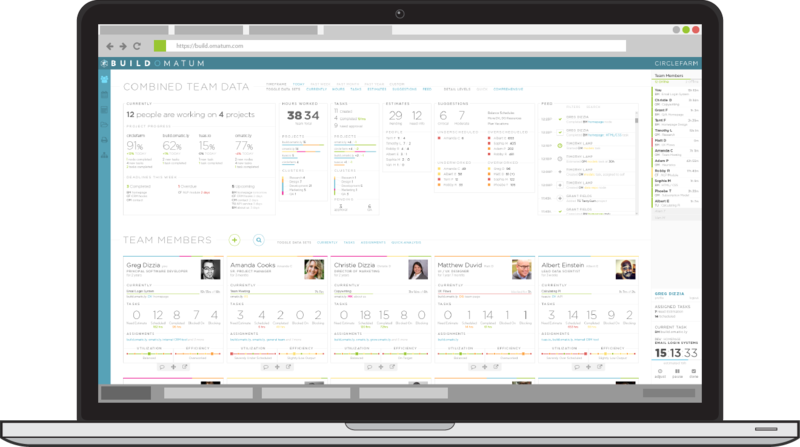 With clear insight into an individual's food consumption, Omatum will be able to determine how that person's diet affects work performance, sleep habits, relationships, etc. Meal planning shouldn't be a huge investment of time. Create meal plans that can be personalized for nutritional needs, food preferences, budget, and schedule. Whatever your goals, we'll help you get there. Calories and nutrients are tracked automatically and will help influence advice that our system offers you. Streamline the shopping process. Grocery lists are automatically generated from the recipes chosen. We can even arrange the list based on how and where you want to shop. How much impact can a good rest pattern have on your life? More than you've ever thought possible. Data from SLEEP will interact with productivity metrics, weight loss metrics, and more to provide you with a full picture of how important sleep is. Minimize grogginess and feel refreshed upon waking. The sleep phase correlated alarm will suggest bedtime or wakeup times based on your actual REM cycles and the needs of your daily life. Prevent exessive snoozing and have more energy during the day. Our system offers wake up challenges and an accountability system designed to wake you up on time. The early bird gets the worm. Adjust bedtime and wakeup times based on your next day plans, let us figure out how to maximize your sleep hygiene. Integration with the OMATUM ecosystem to show how diet, sleep, and work may impact or be impacted by exercise routines. Exercise is a primary component of a healthy sleep schedule, and effective diet, and maximized work productivity. Get fit. Our comprehensive virtual personal trainer covers all areas of fitness. We track your workout, assess the activity, and provide up–to–the–second guidance based on that information. Maintain workout effectiveness. Workout difficulty levels will increase gradually to provide a challenge and move you towards your chosen goal. Be the best version of yourself. Select a health objective and customize a routine based on available equipment and physical ability. The data we gather from other Omatum products, such as BUILD, will be integrated directly in to the RELAT engine, and will provide valuable insights into actions a user can take to correct bad relationships and grow good ones. Make new friends and keep the old. Get insight into relationship health so you can be proactive and have healthier and richer relationships. Be a peacemaker. Our tool will analyze messages, identify passively hostile language, and help you resolve potential pressure points. Smart suggestions. You’ll receive reminders for significant events in other people’s lives as well as a suggested action to help build the relationship.